Yellow hard hat on, bent over like the Hunchback of Notre Dame, walking through puddles and under scaffolding, I made my way along the tunnel pocked with yellow-painted holes where the dynamite went into the walls. At the end of the tunnel I looked through the 3rd Wall, a one-windowed barricade that separated me from a chamber filled with water and bombs, ready to be detonated in case of attack from the North. 170 meters away and 200 feet above my head was the border; it was the closest I’ll ever get to North Korea. The 3rd Infiltration Tunnel was discovered under the De-Militarized Zone (DMZ) in 1978 after a North Korean defector provided intelligence of its existence. Just over a mile long and 6.6 feet tall and wide, the tunnel is one of four that have been found so far; South Korea suspects the existence of at least sixteen. It is estimated that if the tunnel were to reach Seoul, which is the suspected goal, North Korea would be able to funnel 30,000 soldiers through in an hour. 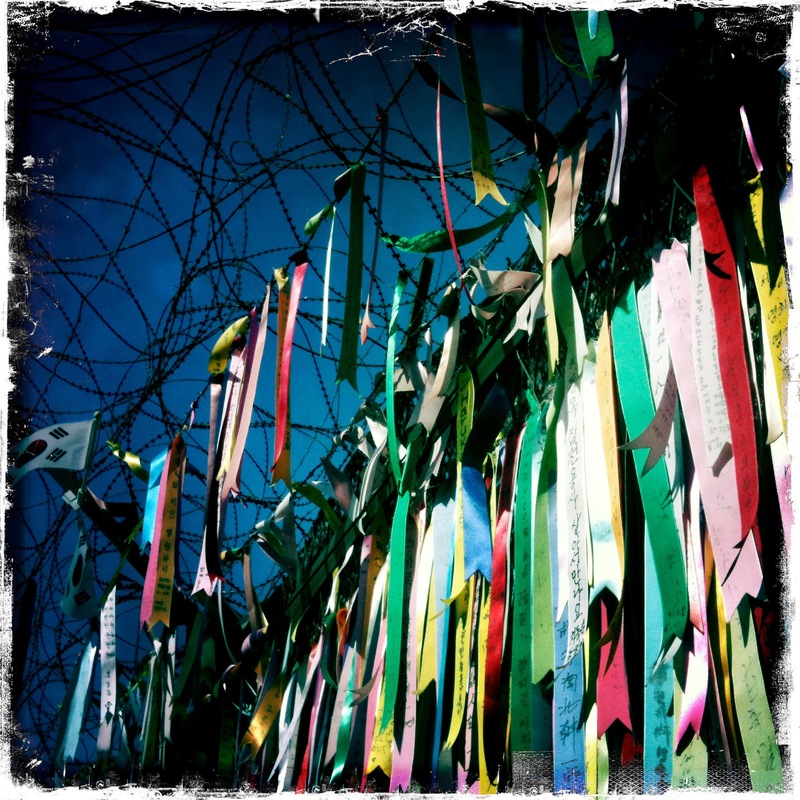 This site is considered the “highlight” of the DMZ tour, but that is because it turns out that we took the tame tour. 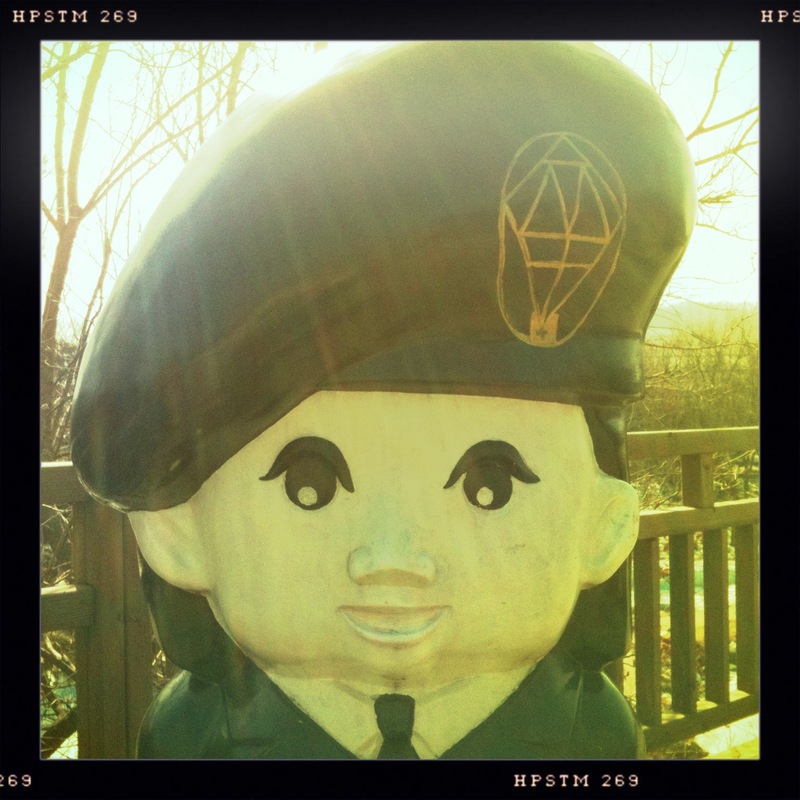 Our tour didn’t include a trip into the Joint Security Area (JSA) and the village of Panmunjeom, which sits smack in the middle of the DMZ, literally on the border between North and South Korea. The JSA contains the Bridge of No Return, which South Koreans built to provide a voluntary one-way trip for those wanting to return to the North, and the famous Military Armistice Commission Conference Room, which has a line down the center of the table in the room where North and South sit for negotiations. Statue of a North Korean soldier. Doesn’t she look friendly? 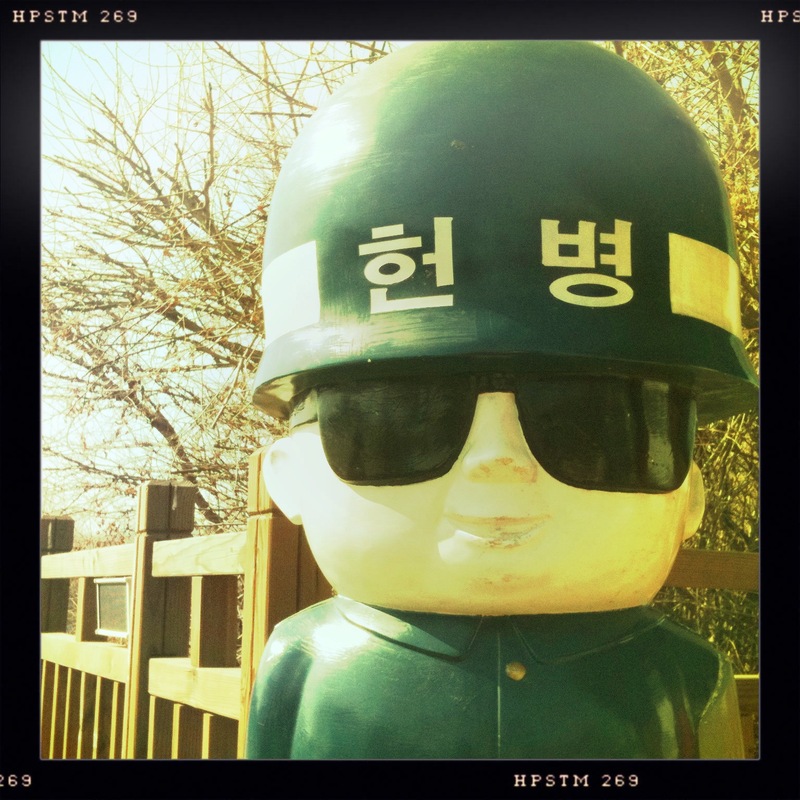 I was told that at the JSA, South Korean soldiers wear sunglasses to prevent any eye contact being misconstrued by North soldiers as aggressive in nature. 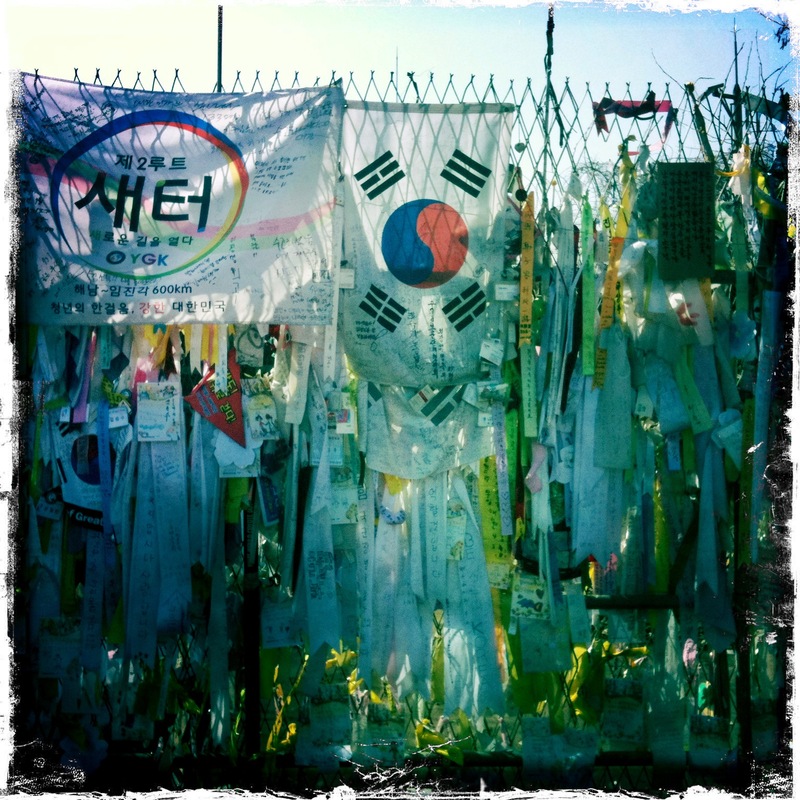 Those of us who took the “tame” tour yesterday plan to take another half-day and go to Panmunjeom and the JSA. I can’t imagine leaving here without experiencing as fully as possible the persistent threat that South Korea endures on a daily basis. As our tour bus wound the steep hill up to the Dora Observatory, the tour guide reminded us to stay with her at all times, as the serene forest on either side of us is still riddled with landmines. “The deer can smell them, so they don’t die,” she said. I got one view of North Korea from the top of the Dora Observatory. Photos are allowed to be taken behind the yellow Photo Line. It’s very hard to make out, but just left of center is the tallest flagpole in the world, a black spire flying the immense, 600-pound North Korean flag; at the bottom of the picture about two-thirds across is the white flagpole flying the South Korean flag. It has been deliberately kept shorter than North Korea’s flag. The scene seriously looked like Tolkien’s Two Towers and the plains of Mordor. 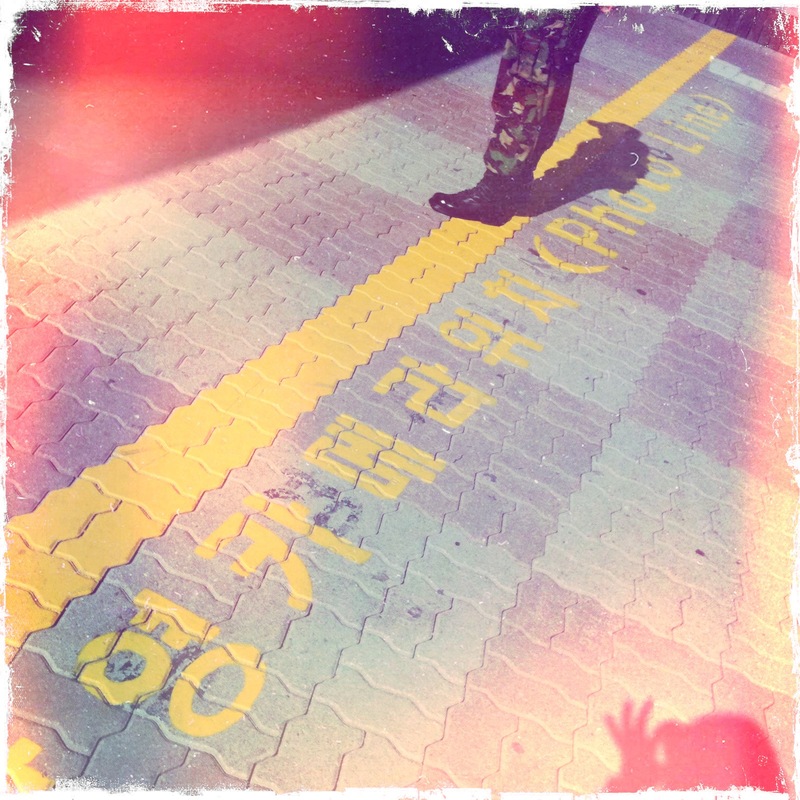 The tour guide gave us some interesting facts about the two Korean militaries. Both countries have mandatory military service: the South’s men must serve 3 years, while the North’s men serve 10 years and its women, 7 years. This discrepancy probably accounts for the difference in size: North Korea, with a total population of 23 million people, has an army of 1.2 million; South Korea’s army has 600,000 soldiers although its total population is twice that of its neighbor. I heard this, and saw the 3rd Infiltration Tunnel, and in an instant I understood just how vulnerable South Korea would be if American troops weren’t here to support them. 200,000 of our soldiers serve here, in the “last divided country in the world”, to preserve this peaceful nation against a constant and heart-breaking threat. Heart-breaking because I have trouble even thinking of North Korea as a separate country; it feels more like the Shadow soul of the whole Korea, one that the South is constantly inviting back to wholeness. It’s closer than brother-to-brother. It’s self-to-self. 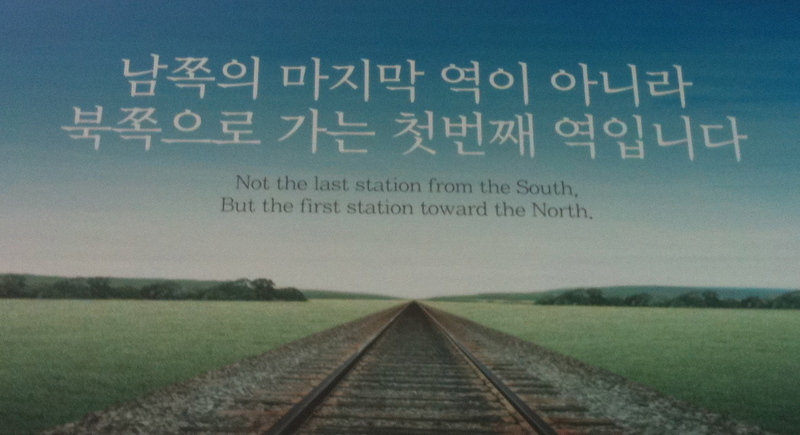 I was told that Dorasan Station sits in readiness to extend north as soon as the border opens. 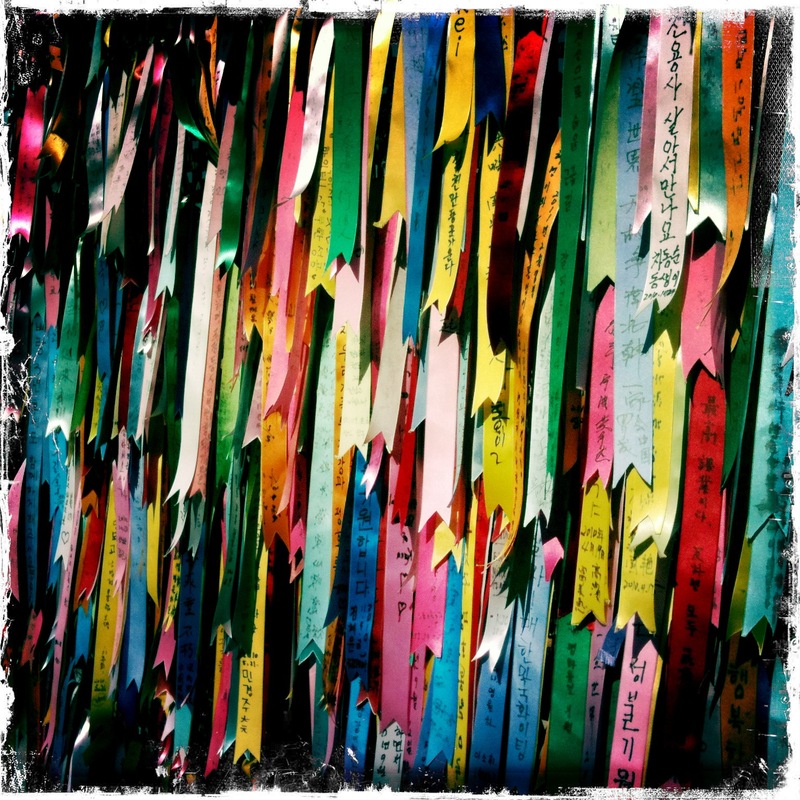 At the Freedom Bridge in Imjingak Park, at the edge of the DMZ, thousands of colorful ribbons wave one wish: Unification. Become one. Whole again. Having just visited Berlin in September probably helped me appreciate what has happened to this country. Back in Berlin, our friend Ralf told us about the day the city became divided. No warning. Berliners had just started their day, had just gone a few blocks down to get groceries or across town to work. They would not be allowed to go home that day; most of them would never see home or family again. I suspect the division of the whole Korea was much the same. Can you imagine? The depth of grief and loss? My heart breaks just trying. And I guess that’s what makes the South’s constant peaceful hope so inspiring to me. They have flourished as a society, becoming one of the most successful economies in Asia with a worldwide foothold in the technology industry. I find it sort of perfect that the 3rd Infiltration Tunnel, a terrifying threat from the Communist North, has been harvested by the South as an economy-stoking tourist attraction, without Disney-fying or making light of the reality. While I don’t feel a strong desire to come back to Korea, visiting the DMZ has given me mounds of respect for this country and its people, a U.S. military intervention that I can totally get behind, and gratitude for the truly privileged life I live. I think I said it before but you could become a travel reporter instantly. I always have the feeling I am there with you the way you write about your trips. Wow. What an amazing experience. I’m so glad you went and that you shared all of this with us. This is a beautifully written piece. Thanks.